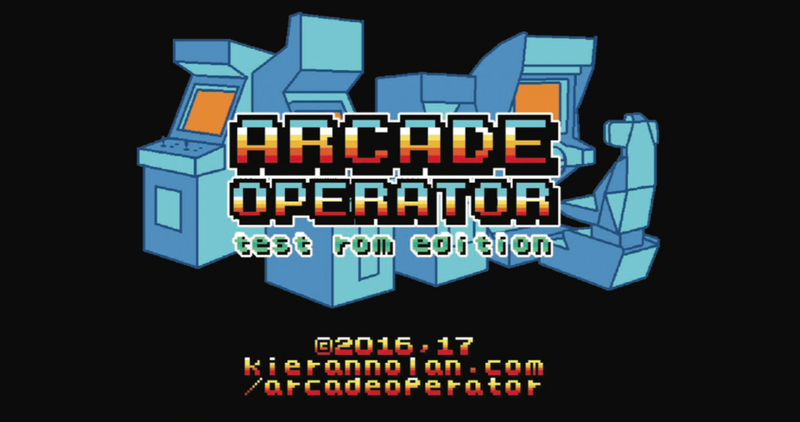 Arcade Operator (Test Rom Edition) is an experimental art game where the player takes on the role of a video game Arcade Operator. 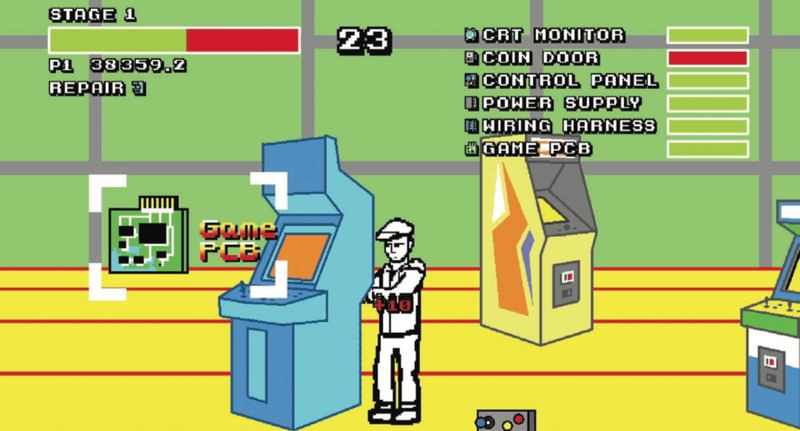 Instead of playing the coin-ops present in the diegetic space of the onscreen arcade, the player must interface with the game cabinets as both operator and technician. Arcade Operator’s style of interaction is closely based on the side-scrolling brawler sub-genre of arcade gaming, switching the user context to a non-gameplay mode of interfacing with arcade video game platforms, albeit in an abstracted form through an arcade play mechanic. Overall, we hope this book helps you feel more con dent with the techniques, tools and terminology associated with coin-operated electronic games. We wish you good luck and good troubleshooting! Arcade Operator (Fig. 1) is the sequel of sorts to Control (Nolan, 2013), an experimental art game about interface constraints. While Control articulated the limitations of physical game controllers through a down-sampled onscreen representation of the hand-to-joystick and gamepad link, Arcade Operator uses arcade-brawler gameplay conventions to abstract the act of manually interfacing with arcade circuitry. Arcade Operator is also a critical artifact, a metagame using the medium of the arcade video game interface to reflect on the software and hardware of game interfaces. Specifically, Arcade Operator reflects on the context of user interfaces by articulating the non-play actions of an arcade operator through the control schema and visual interface conventions of a side-scrolling, arcade-brawler aesthetic. Arcade Operator is a self-reflexive critical play artifact, a metagame meant to investigate user context and interface conventions in arcade video games. The term arcade is used throughout this paper to describe both the situated space of the video game arcade as well as the genre of arcade games, whether home system conversions, or arcade-style games developed specifically for home consoles. In Metagaming, Stephanie Boluk and Patrick LeMieux present several definitions of the term metagame; they refer to a 2011 blog post by Andy Baio in which he describes metagames as “playable games about video games.”  Arcade Operator further focuses this definition as it extends the concept of metagaming to consider the physical upkeep of video game hardware, and not just game software. Regarding critical play, Mary Flanagan states that it “means to create or occupy play environments or activities that represent one or more questions about aspects of human life.”  This definition of critical play relates to philosopher and game designer Stefano Gualeni’s definition of self-reflexive games as “video games that are deliberately designed to materialize, through their gameplay and their aesthetic qualities, critical and/or satirical perspectives on the ways in which video games themselves are designed, played, sold, manipulated, experienced, and understood as social objects.”  Though the occupied environment in Arcade Operator is the diegetic space of the arcade-brawler genre, the game critiques its tropes and limitations to examine game software and hardware by investigating the role of the Arcade Operator as facilitator of arcade gameplay. By taking the arcade interface and simultaneously presenting it as an enabler of both play and non-play, Arcade Operator subtracts several core elements from the brawler mechanic, namely the enemies and the brawling. In doing so, the game emphasizes the repetitive nature of the operator’s task, and reimagines enemies as time and resources. The role of the interface is to facilitate communication, whether between a human and machine, between two or more humans mediated by a machine, or between machines or the internal mechanisms inside a single machine. An effective interface naturalizes this link, with the most functional solutions ensuring that the conversation flows effortlessly. The abstraction of the machinic, binary processes provided by voice-driven and graphical user interfaces (GUIs) allows multinational technology companies access to the widest markets possible; user-friendly interfaces welcome customers uninvolved or uninterested in hardware and software development, thus ensuring maximized sales. The interface level marketed to the pay-to-play arcade video game player is an intentional extension of this consumerist ideology; however, video game usability and playability are not mutually inclusive. Playability demands a certain amount of challenge: enough to frustrate, but not enough to deter continued engagement. The player-level interface is only one of many layers possible with each gaming platform, and the level of accessibility is always dependent on the context of the specific user. While current game developers and engineers construct game environments through software interface contexts, the arcade operator who runs the arcade and maintains the machines has a unique, non-play level of interaction with the arcade cabinet hardware. Operator-level interfacing with the arcade platform ranges from routine tasks, such as emptying the coin-tray and configuring game values via dip-switches, to more complex tasks, such as installing, troubleshooting, and repairing game printed circuit boards (PCBs). To the playing and paying public, arcade video game cabinets represent closed-off, black box computing systems. An arcade cabinet’s inner workings are strictly utilitarian, right down to the unadorned, exposed nature of the cathode ray tubes and PCBs. Arcade Operator is an experiment in taking the repair and maintenance tasks of the Arcade Operator and making the associated processes and platform components visible to the arcade player. One of Arcade Operator’s inspirations is the end sequence for Golden Axe, released by Sega in 1989 as a response to Double Dragon (Technōs, 1987). It took the established side-scrolling, beat ‘em up game and fused it with the magic and sword elements associated with the fantasy genre to create a barbarian-themed, hack-and-slash finale. Its ending sequence initially plays out as expected: after Death Adder is defeated and both the King and his daughter Yuria are released, players are congratulated with the completed world map, signed off “fin” with a quill pen. It’s a brief, but suitable moment of closure. The screen then fades to black, transitioning to a scene at a Sega amusement arcade where three children are gathered around a video game coin-op cabinet identified on a poster as “Great Axe.” Smoke erupts from the screen as one by one, the villains of Golden Axe jump out of the machine and chase the kids outside and down the street, followed in hot pursuit by the heroes. This representation of the normal situated space of the Golden Axe arcade machine within its own game world humorously brings the game characters into the universe of the players; game immersion normally entails players immersing themselves into the world of its protagonists, but in this case, the game characters emerge into the world of the player, reflected in a detached third-person view through the visual and diegetic interface of the arcade video game itself. Arcade Operator offers a low-resolution approximation of a real-world task via the arcade interface. It uses the 16-bit arcade video game aesthetic as a vehicle for its simplified take on modelling a real task and environment. Yu Suzuki’s Sega arcade titles including Hang On (1985), Outrun (1986), and G-LOC: Air Battle (1990) deliver the immersion of motorcycling, driving, and flight to the amusement arcade space. Each game is accompanied by enhanced action aesthetics, minus the steep learning curve associated with their real-world equivalents. Their bespoke arcade cabinets provide a bolstered sense of connection by basing the arcade control system around the literal, real-world machine interface the game is modeled on. During the 1980s and early 1990s, Codemasters published a series of budget-priced games for 8-bit and 16-bit home microcomputers using Simulator as the title suffix. These titles included BMX Simulator (1986), SAS Combat Simulator (1988), and Pro Tennis Simulator (1989). The use of “simulator” in the title suggested a level of realism on par with industry level flight simulator systems. In truth, the titles are lo-fi arcade-style abstractions. Pro Tennis Simulator is described by comprehensive game database MobyGames as “bare bones action for 1 or 2 players.”  Devoid of first-person immersion, let alone any remote resemblance to their real-world inspirations, their gameplay is primarily characterized by reflex-driven action and basic audiovisuals. Another point of reference for Arcade Operator’s design is that of repair as gameplay, exemplified by Lucas lm Games’ Night Shift (1990). Night Shift is a game in which the player character, Fred or Fiona Fixit, must maintain a factory by jumping from platform to platform, ensuring all the switches and levers are at the correct setting. All factory operation tasks are reduced to a single action button, and four arrow keys move the character around the gamespace. While not an arcade-born game, it does share several gameplay characteristics with arcade platformers. In the context of arcade genre repair games and Night Shift specifcally, it is difficult to ignore Fix-It Felix Jr., the faux-classic arcade game invented for the 2012 Disney movie Wreck-It Ralph. As with Night Shift, gestures associated with manual labor are reduced to a single action button control. Each successful repair action produces a chain of visual feedback as Felix moves frantically, partly obfuscated by an animated cloud of smoke and building debris. It was necessary from the outset to implement several constraints, since there were so many possible directions that the game build could take. Parameters were set not only in terms of the game’s audiovisual look and feel, but also regarding the gameplay aesthetics and interface style. Arcade Operator’s gameplay constraints were modeled on those of the side-scrolling brawler arcade sub-genre mechanic. Typically, this style of gameplay features a character traversing a scrolling play field from left to right, using well-timed attacks and jumps to overcome enemies and progress onwards. For Arcade Operator’s take on this action genre, two main constraints were implemented: the first of these self-imposed limitations was the omission of any enemy characters. This condition was inextricably linked to the second constraint, which was to include no combat or violence. Power ups and weapons are replaced with spare parts. Anthropomorphizing the arcade cabinets was ruled out to strike a balance between real-world authenticity and 16-bit abstraction. The static cabinets don’t move around, and they don’t at- tack. Instead of damaging them, the player undamages the cabinets by using the action button to engage in repair tasks. Successful repairs are reflected by the repair bars for each coin-op component moving from red to green. Fully-repaired cabinets change visually from plain blue to full color. When all cabinets on a level are repaired, the game progresses to the next level. Arcade Operator’s static interface comprises a level timer, score, icons representing each coin- op repaired, and repair bars for each individual cabinet component. A composite repair bar summarizes all repair progress across the level (Fig. 2). The game world is presented in a slightly off-perspective pseudo-3D style, inspired by the aesthetic of Double Dragon and other popular brawlers, allowing the player to move around the arcade cabinets needing repair. Fig. 2. PCB repair operation in-game. Kieran Nolan, Arcade Operator, 2017. Image courtesy Kieran Nolan. Arcade Operator’s initial concepts were rendered at 320 x 240 pixels, the base resolution for the JAMMA arcade cabinet interface standard. These graphics were then scaled up by 400% and modified from 4:3 resolution to widescreen to accommodate modern displays. The low-color resolution is a nod to the visual constraints evident on home computer ports of arcade titles during the 1980s and early 1990s. The home-conversion style aesthetic was also chosen for expediency as well as clarity. The Arcade Operator soundtrack was composed with Little Sound DJ (LSDJ), a tracker-based music sequencer designed for the 1989 Nintendo Game Boy Dot Matrix Game (DMG) console. It allows the user to harness the Game Boy’s four-channel chip (one wave channel, two pulse channels, and a noise channel). LSDJ isn’t an official Nintendo software product, but has been hugely influential in the development of the chiptune music scene over the last decade. All voice samples were recorded live and then processed with a bit crusher effect in Audacity to replicate the muffled low-bitrate sound characteristic of 1990s arcade sound hardware. In arcade fighting games, a single button push can represent numerous actions, including attacking an enemy, picking up a weapon, opening a door, breaking a crate or barrel, administering first aid—or in the case of Final Fight (Capcom, Creative Materials, 1989), eating a roast turkey randomly found on the street to replenish health. Arcade Operator takes the skill-set of repairing arcade video game cabinets and transplants it within the brawler mechanic. Arcade Operator’s control scheme is limited to eight directions of movement and two action buttons, “fix” and “crouch.” Pressing both fix and crouch at the same time allows the player to pick up or drop spare parts. The specialized, niche craft of arcade maintenance in its varied guises, including replacing circuit boards, degaussing cathode ray tube screens, and soldering loose wires, are reduced from a sequence of complex actions to, at its most complex, two simultaneous button presses. Fig. 3. Level introduction screen displaying the arcade cabinet’s anatomy. Kieran Nolan, Arcade Operator, 2017. Image courtesy Kieran Nolan. Augmentations to this interface style were considered; for example, gameplay could have included multiple choice menus allowing the selection of different repair types. These more complex mechanics were abandoned, as it would dilute the arcade sub-genre with elements unrelated to brawler mechanics. For example, if elements such as revenue generation and stock control were introduced, the gameplay style would move from arcade action to a business management game, lessening the impact of its critique of the brawler mechanic. 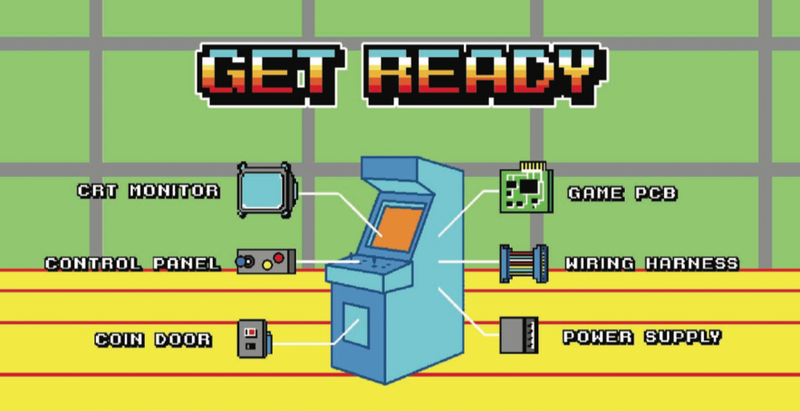 Each arcade cabinet has six components: the control panel (either joystick or steering wheel- based), power supply, wiring harness, cathode ray tube (CRT) monitor, coin-door, and the game PCB (Fig. 3). The arcade operator uses his hands to repair each of these, but is aided in the process using spare parts found on each level (Fig. 4). Fig. 4. Replacing the Cathode RayTube screen raises the repair bar to 100%. Kieran Nolan, Arcade Operator, 2017. Image courtesy Kieran Nolan. Time and material resources are the enemies of the arcade operator as he works to fix his video game cabinets before the opening of another business day. Racing against an on-screen timer, the player character can only carry one piece of replacement hardware at a time, and although spare parts are used to expedite the repair process, placing the wrong part in the wrong place will register damage. For example, placing the coin-door into a cabinets screen region registers damage on the monitor repair bar. Like Atari’s field operations manual suggests, Arcade Operator doesn’t claim to make the player a professional engineer or technician, but aims to provide players a basic familiarity with the role of the arcade operator and basic terminology of arcade repair and maintenance. While design processes were used to produce Arcade Operator, the result is not a solution to a problem, but rather an opportunity to pose questions regarding video game genres, interfaces, and player contexts: can the arcade gameplay interface experientially articulate the non-gameplay side of interfacing with arcade technology? Specifically, how can the arcade brawler mechanic and its diegetic environment act as an abstracted pseudo-simulator, balancing arcade play and operator-interface contexts? At the time of writing, the game exists as a demo “test rom” level, and is undergoing constant revisions. To download the game visit: http://kierannolan.com/arcadeoperator. Kieran Nolan is an artist-researcher exploring the connective and aesthetic properties of arcade video game interfaces. He is Programme Director of the BA in Media Arts and Technologies at Dundalk Institute of Technology, and a PhD candidate in Digital Arts and Humanities with the GV2 Research Group at Trinity College, Dublin. http://kierannolan.com. Arcade Operator Video Trailer: https://vimeo.com/217395627. 1. Stephanie Boluk and Patrick LeMieux, Metagaming: Playing, Competing, Spectating, Cheating, Trading, Making, and Breaking Video Games (Minneapolis: University of Minnesota Press, 2017), 6; Andy Baio, “Game about Games,” Waxy, February 1, 2011, accessed June 9, 2017, http://waxy.org/2011/02/metagames_games_about_games/. 2. Mary Flanagan, Critical Play (Cambridge MA: MIT Press, 2009), 6. 3. Stefano Gualeni, “Self-re exive video games: observations and corollaries on virtual worlds as philosophical artifacts,” Game: The Italian Journal of Game Studies 5 (2016), http://www.gamejournal.it/gualeni-self-re exive-video games/. 4. Florian Cramer, “What Is Interface Aesthetics, or What Could It Be (Not)?” in Interface Criticism: Aesthetics Beyond Buttons, eds. Christian Ulrik Andersen and Søren Bro Pold (Aarhus, Denmark: Aarhus University Press, 2011), 117. 5. Tom Igoe and Dan O’Sullivan, Physical Computing: Sensing and Controlling the Physical World with Computers (Boston: Premier Press, 2004), 21. 6. “Pro Tennis Simulator for Amiga (1990),” MobyGames, accessed June 12, 2017, http://www.mobygames.com/game/pro-tennis-simulator. 7. In 1985, the Japan Amusement Machine and Marketing Association (JAMMA) created the JAMMA wiring standard, allowing all arcade cabinets wired in the JAMMA standard to run any other game built to this standard. As Japan designed many of the most popular 1990s game cabinets, the JAMMA became the standard by default. John St. Clair, Project Arcade (Indianapolis: Wiley Publishing, Inc., 2011), 316.